Concrete is one of the most widely used materials in the world so it is no wonder that it was just a matter of time before it found its way into our home decor. Concrete is quickly becoming the latest trend and method of self expression in the kitchen, bathroom, and outdoor living space in the form of ” The Concrete Countertop”. Concrete has been made to to resemble many other natural materials including wood, stone, marble, granite and a variety of other finishes. With its variety of possibilities and endless custom colorations, designers are using it to create unique and distinctive surfaces for kitchen cabinets and islands, bathroom vanities and tabletops. 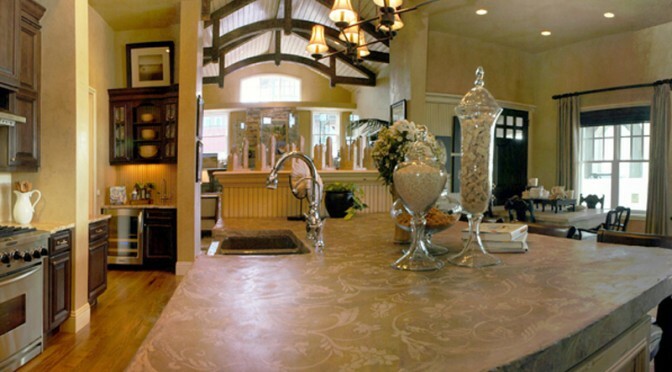 When creatively crafted, colored and finished, a concrete countertop can take on the appearance of a custom natural quarried stone material while being formed and contoured into shapes and finishes not possible with any other material. Here are some ideas, inspiration & articles to get you educated on ‘The Concrete Countertop’. What is a pre-cast concrete countertop vs a pour in place? What can I expect when choosing concrete as a countertop material? What type of decor warrants concrete as a finish? Are Concrete countertops really functional? Will my cement countertop crack? What are my design options and color choices for concrete counters? Can’t I make my own concrete countertop? What is the price or cost of Concrete countertops? How thick is a concrete counterop? How do I clean my concrete countertop? How do I maintain a concrete countertop? Do i need special cabinets to support the weight on concrete on them? What are the options in edge design and finishes for my countertop?